We can't tell who she is, and it's unlikely that she's playable. But it nevertheless looks like Assassin's Creed: Unity, like earlier games in the series, will have female assassins. No comment from Ubisoft. The lady appears briefly at around the 7:24 mark of a new making-of video posted today by gaming site IGN. 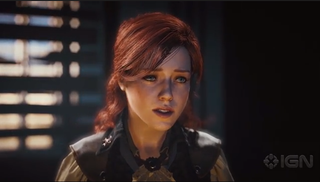 Unity, which takes place in Revolutionary France, was criticized by some journalists and fans during E3 for not including the option to play as female assassins despite the inclusion of customization options and co-op play. One of the criticisms was that, simply, the most famous assassin from the real French Revolution was a woman, so an absence of female assassins would be weird. Ubisoft promised to show female characters prior to the game's October release. This must be our first glimpse. Update: As some readers have noted, the cross on the character's collar could indicate that she's a Templar, the order that opposes the Assassins. The IGN video concludes with a tease for a story-centric video that will detail the heavy involvement of the Assassins and the Templars in Unity's version of the French Revolution. Update 2: Ubisoft confirms that she is indeed a Templar. Her name is Elise.